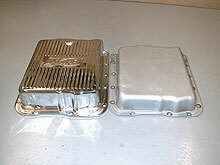 The pan on the left is the new B&M chrome pan and the pan on the right is the original powder coated factory pan. The new pan measures one inch deeper than the original one. This is going to reduce the ground clearance slightly but whether it poses a problem remains to be seen. The extra oil capacity should help with cooling. I looked into getting an aluminum pan but none of them were polished and the price was slightly higher. 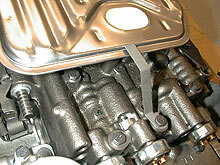 The B&M pan has a very nice finish and will match the Mr. Gasket oil pan we will be using on the engine. 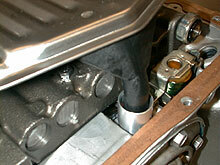 Since the pan is one inch deeper than normal, B&M sends along an extension for the oil filter/pickup. 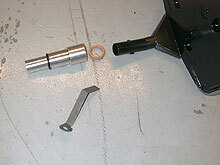 This photo shows, from left to right, the extension with O-ring installed, the one-inch longer support spring, the multi-lip seal, and the end of the filter. The extension and O-ring's are slid together in the order shown. This essentially drops the filter one-inch to correspond with the added depth of the pan. This photo shows the new extension in place. This extension goes directly into the transmission pump just as the filter normally does. 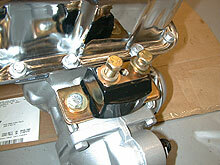 The longer support spring is put in place using one of the bolts in the valve body. This spring basically keeps the filter from sagging far enough to hit the pan. 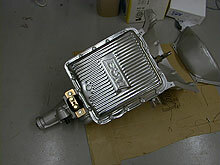 The transmission pan gasket was replaced with the new neoprene gasket. Gaskets are cheap, my suggestion is to never use an old one over again unless you have to. Neoprene gaskets work well in conditions where you don't have perfectly dry surfaces. I used the original bolts that were powder painted when the case was painted. If I can find some new chrome or stainless bolts I will replaced them later. While the transmission was upside down it was the perfect time to mount the new Energy Suspension transmission mount. This is a urethane mount that is much stiffer than a conventional GM mount. The stiffer transmission mount is a must when running extreme amounts of horsepower. Sure looks pretty doesn't it? We will be covering hooking up the TV cable when we put the transmission in the car. Other things like U- joints, drive shaft, transmission filler tube, transmission cooler, etc. will also be covered as it happens. Please keep in mind that I'm learning just like many of you are as this project progresses. Before the shop started working on this transmission I knew nothing about a 700-R4. I can't say I know too much right now either but it's a lot more than I knew before. I've never hooked up the TV cable on a 700-R4 but will try my best to relay what I learn when the time comes. Troy from the transmission shop offered to help me install it when the time comes and I think I'll take him up on that. Years of experience make a difference. Maybe I'm just spoiled after doing business with all the great people involved in this project. You guys are great!